Love money? Or stocks and bonds? Here's where a lot of it go through - in Wall Street. This is the very heart of New York's financial district. The concrete canyons encompassing this part of lower Manhattan has seen the rise and fall of a market-driven economy in the United States. We joined a free walking tour of this iconic street and the surrounding areas as part of the ongoing River To River Festival. 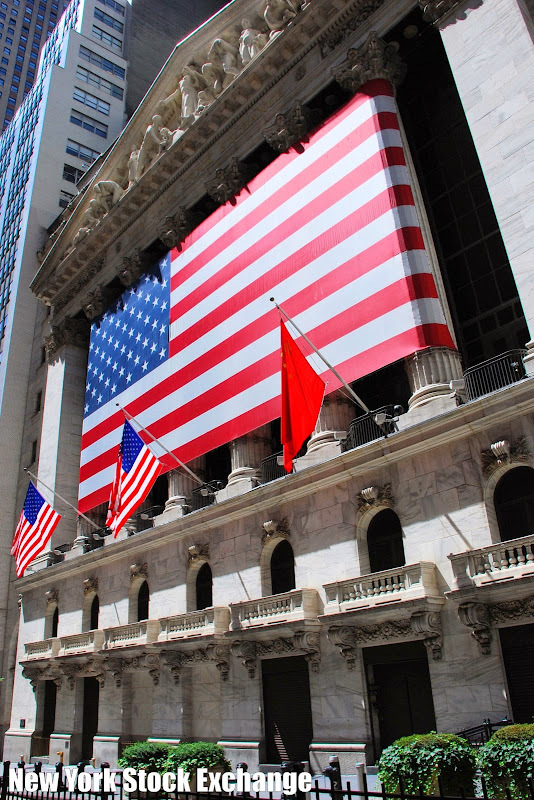 I don't understand much about how things work in Wall Street and how oil prices - today's really pressing pain in the neck - are dictated by the New York Mercantile Exchange in nearby World Financial Center but that's not what I came here for. I was more interested in the history and our guide, a hulking young man vying for his Ph.D in English literature at the NYU, was quite good at it. 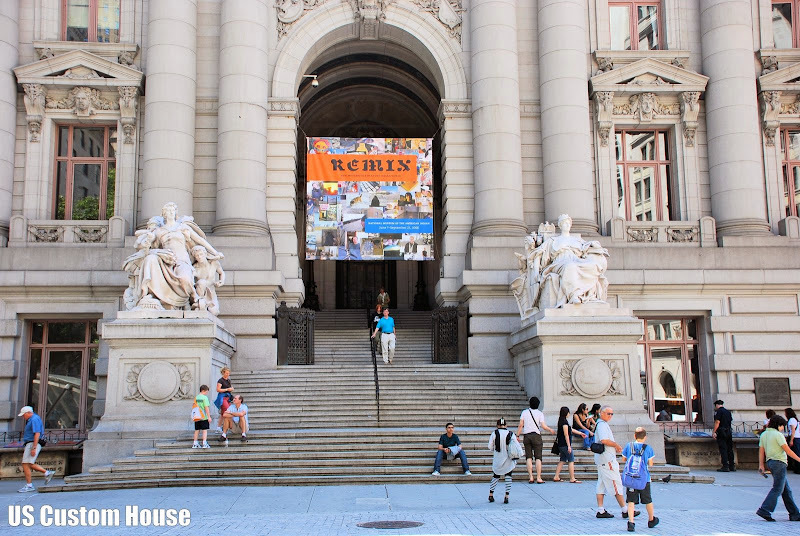 He started our midday trek in front of the Beaux Arts building US Custom House. This was where collection of duties on goods where done for the New York ports during its heyday. It now houses a branch of the National Museum of the American Indian. 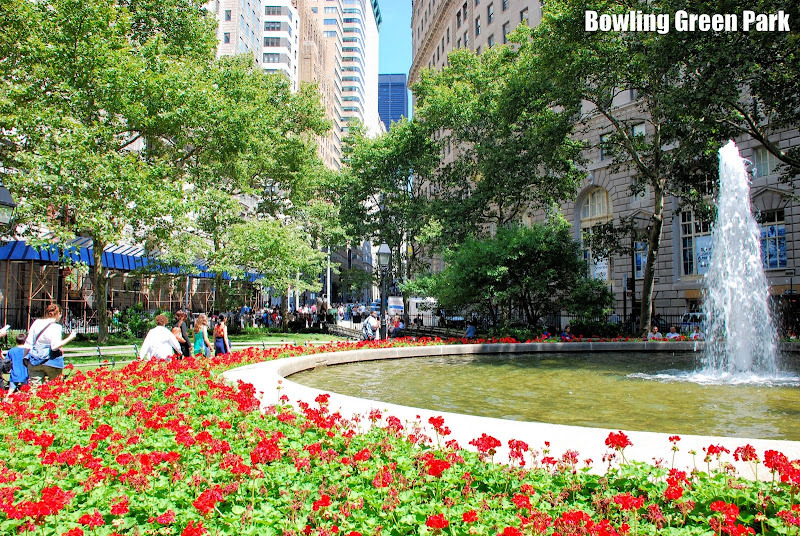 We passed by the Bowling Green park, considered New York City's oldest park, right where Broadway terminates. Here, hordes of tourists flock in front of the Charging Bull bronze statue - very much a symbol of America's financial might. This statue was built and financed by the Italian sculptor Arturo Di Modica after the 1987 market crash. 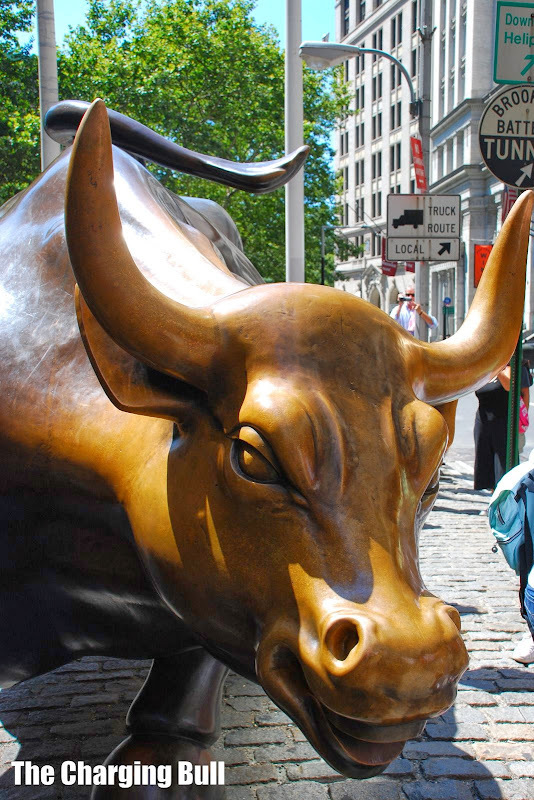 Out of curiosity, most people rub the bull's testicles to bring good financial luck - even stockbrokers do it! 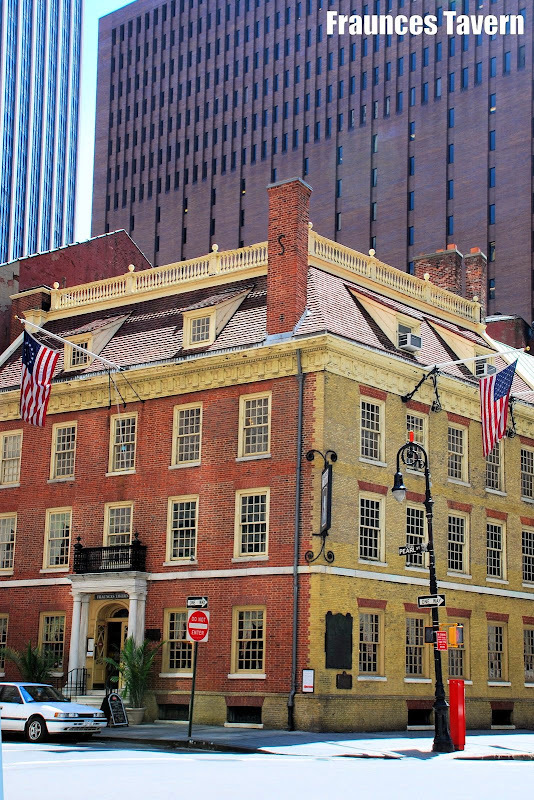 At the intersection of Broad and Pearl Streets, the Fraunces Tavern, a low-rise building seemingly out-of-place with its towering neighbors, is listed in the National Register of Historic Places for its role in the days prior to the Revolutionary War. Meetings were held here including a then Gen. George Washington giving a farewell address to his officers in 1783 at the end of the Revolution. 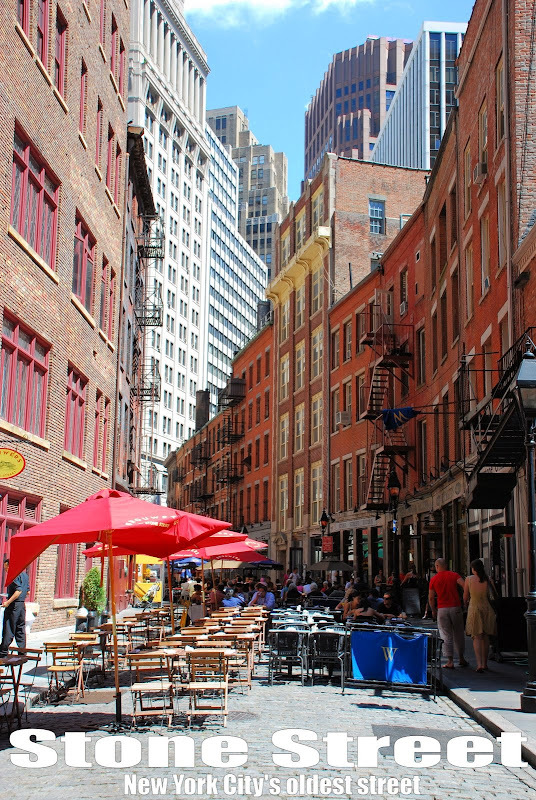 What used to be a narrow alley first developed by the Dutch colonists in the 1600s is what's now called Stone Street, considered New York's oldest. One wonders what secrets are held in this cobblestone street but as we pass by on this glorious Saturday afternoon, the rows of restaurants mostly catering to stockbrokers and hedge fund managers had practically blocked the street with tables and chairs for the tourist crowd. Walking a bit more and we finally emerged into Wall Street. 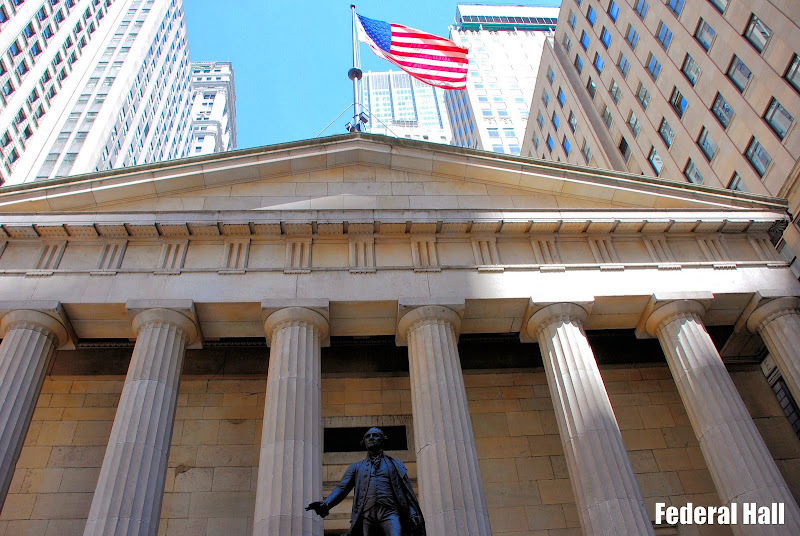 Prominent here besides the New York Stock Exchange building is Federal Hall, a historic site where George Washington was inaugurated as the first President in 1789. 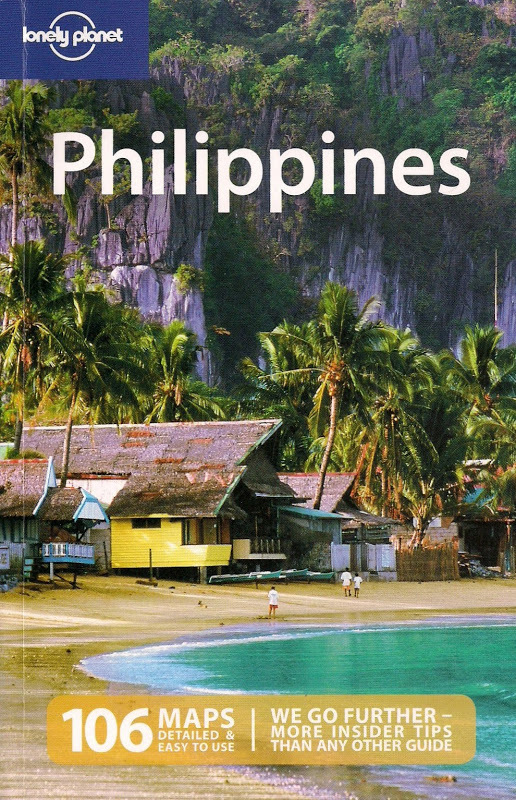 It also served as home to the first Congress of the country and the site where the Bill of Rights was passed. Don't forget: New York was the first capital of the US. Post 9/11 measures have made Wall Street look like a fortress - there are blockades everywhere and maximum police visibility as if the Pope is in town. A bombing occurred here in Sept. 16, 1920, in front of the J.P. Morgan headquarters that killed 38 and injured hundreds - a case that was never solved. When the market crashed in 1929, that ushered in the Great Depression. Depression? Hmmm.....we are in 2008 and the gloomy state of the US economy at this time is certainly making a lot of Americans depressed: soaring gas prices, plunging housing market, joblessness, tight credit, inflation. How sad.